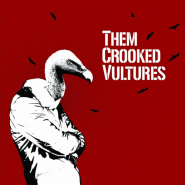 Them Crooked Vul­tures is the newest rock super­group made up of the house­hold names of the genre, com­pris­ing Dave Grohl of the Foo Fight­ers, John Paul Jones of Led Zep­pelin, and Josh Homme of Queens of the Stone Age. Found­ed ear­li­er this year, the band released its self-titled debut album in Novem­ber. Unfor­tu­nate­ly, the group hasn’t quite man­aged to ful­ly har­ness the com­bined tal­ent of its three quite expe­ri­enced mem­bers, and so Them Crooked Vul­tures nev­er quite ris­es past medi­oc­rity. Instru­men­tals on Them Crooked Vul­tures are cer­tain­ly inter­est­ing. The album begins with the band slow­ly devel­op­ing half-lines, but stops, and pro­ceeds to play the rest of the track at a sound that seems still some­what under­de­vel­oped. Thank­ful­ly, near the halfway point, the band begins to play more active­ly, which com­bats the bor­ing­ness of the slight­ly under­de­vel­oped lines, but the sec­ond half of the track ends up even more repet­i­tive than the first. This is, nat­u­ral­ly, a seri­ous prob­lem on a five plus minute track. Indeed, the “epics” of the album (the first track, as well as “Ele­phants,” and “War­saw or the First Breath You Take after You Give Up”) all seem to have a strong ten­den­cy towards high lev­els of rep­e­ti­tion - else they just drag on and on for far too long - such that they end up not real­ly being epic on any lev­el what­so­ev­er. Some tracks, though, are sig­nif­i­cant­ly bet­ter. On “Mind Eras­er, No Chas­er,” the instru­ments, while not ter­ri­bly inter­est­ing on their own, cer­tain­ly match the vocals and lyrics quite well. Fol­low­ing that track, “New Fang” main­tains an almost melod­ic drum line. Sur­pris­ing­ly, the sixth track is one of the most suc­cess­ful: while some­what repet­i­tive, the slap and the oth­er­wise hard edges on most of the lines are entranc­ing. And though it clear­ly over­stays its wel­come, “War­saw or the First Breath You Take after You Give Up” does have some out­stand­ing lat­er sec­tions. Vocal­ly, Them Crooked Vul­tures is large­ly unex­cit­ing. Though all of the mem­bers of the group have proven them­selves to be skilled vocal­ists in their own work, Them Crooked Vul­tures keeps its vocals on a thor­ough­ly mun­dane plat­form. At no point do the vocal lines of the album rise above the main sound (though they occa­sion­al­ly come close on some of the loud­er tracks, such as “New Fang”). Instead, the vocals are pushed into thick lay­ers of per­cus­sion and gui­tar. Occa­sion­al­ly, they man­age to sound inter­est­ing, espe­cial­ly on the best-con­struct­ed tracks of the album, such as “War­saw or the First Breath You Take After You Give Up,” but this is regret­tably rare. The major­i­ty of the album man­ages the impres­sive feat of mak­ing Josh Homme’s voice sound bor­ing, which cer­tain­ly doesn’t say any­thing good about the album’s appeal as a whole. The lyri­cal por­tion of Them Crooked Vul­tures suf­fers in the same way as do the vocals - they’re sim­ply not espe­cial­ly inter­est­ing. Homme and com­pa­ny haven’t man­aged to make the album lyri­cal­ly appeal­ing, and as such it slips by with­out mak­ing much of an impact. Even occa­sion­al amus­ing sec­tions (includ­ing song titles like “Caligulove”) can’t sal­vage the music from being fun­da­men­tal­ly dull. It’s not so much that it’s bad­ly done or with­out poten­tial - instead, the prob­lem is that it isn’t near­ly com­pelling enough for a near­ly sev­en­ty-minute album. Even if Them Crooked Vul­tures isn’t much bet­ter than mediocre, it is cer­tain­ly extreme­ly inter­est­ing to hear Grohl, Homme, and Jones togeth­er on the same album. And while there are cer­tain­ly a fair share of dis­ap­point­ing spots on Them Crooked Vul­tures, there are more than enough tracks like the frankly excel­lent “Caligulove” to just aver­age out. Instead, the good slight­ly out­weighs the bad, and the album ends up above aver­age, just not by near­ly as much as what such a tal­ent­ed group of musi­cians real­ly deserves.